Interviews with Dan Treanor and Joel Scherzer conducted July-August 2009. Dan Treanor felt that he had done all he could do in Pueblo. 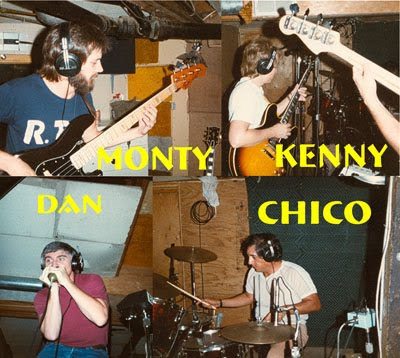 As a member of a number of several successful local bands, including the Steel City Blues Band, Crooks and Hungry Bear, it was time to move up north, to Denver – a route his former Crooks bandmate Kenny Grimes had done earlier. “I wanted to pursue a full time career in music, so my wife Eleanor and I decided to move to Denver where there were more opportunities,” he said. Treanor, Eleanor, and Grimes, along with former Pueblo musicians, Monty Bradbury and Chico Apodoca took up residence in the same Denver condominium complex. “We called it Pueblo North,” Treanor said. There the group would jam and write songs. While in Denver, Treanor kept in touch with Joel Scherzer, the owner of the Pueblo used record mecca, Record Reunion. The two had previously worked together to publish The Pueblo Poetry Project, a book featuring local poets. Scherzer would later enlist Treanor to write the soundtrack for the documentary, Damon Runyon’s Pueblo. 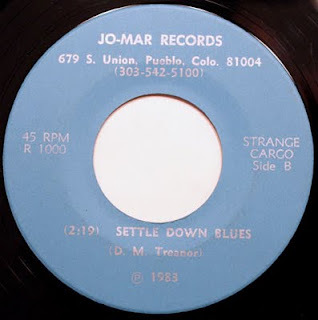 “My business partner, Marc Shulman and I liked their bluesy, harmonica-driven sound,” said Scherzer, who proceeded to form the Jo-Mar label (a contraction of Joel and Marc), for the project. The only thing they didn’t have was a name for the band. Photos and graphics courtesy of Dan Treanor. 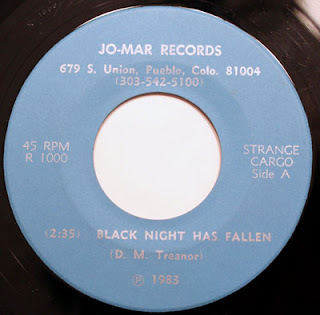 "Black Night Has Fallen" and "Settle Down Blues” - songs Treanor had already been performing with his Denver band, the Terrifics - were picked for the single. The group soon booked a date at Colorado Sound Studios. Treanor estimates about 300 records were pressed, and sold at Record Reunion, in 1983. Shorly thereafter the one-shot group disbanded, and its members went on to other projects. 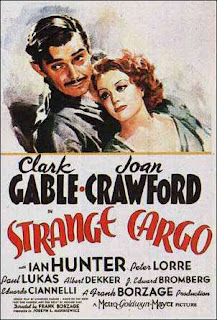 Strange Cargo never played any gigs together, and never recorded another record. Grimes and Bradbury would go on to play in Cactus Jack, a Denver country band. Treanor would make a guest appearance, playing harmonica, on the band’s first album. Kenny Grimes would later move to Austin, and find steady work playing with the likes of Willie Nelson, Jerry Jeff Walker, Hank Thompson, Shelly West, Chris Wall, Gary P. Nunn, Johnny Gimble, and most recently, Hal Ketchum. Chico Apodoca went on to play with the Rendon Brothers and the Tony Romo Jazz Band, for a number of years. He is still playing the jazz circuit in Denver. Dan Treanor keeps busy with Dan Treanor and the Afrosippi Blues Band – considered one of the top blues bands in Colorado, playing about 200 concerts a year.